Tamagoyaki has been a Japanese breakfast staple for so many years that it is widely recognized as part of the country's culinary repertoire. For those who have yet to have an authentic Japanese omelette, there is no better time than the present to become acquainted with this dish. What is Tamagoyaki Made Of? Just like any other kind of omelette, this one is made of eggs, except they are rolled in layers as opposed to folded over. This dish can be made as a savory preparation or as a dessert, depending on one's preference. Non Stick Teflon Frying pan (about 8 inches/20 cm, which is the smallest size) *Note you can try getting a traditional pan as shown below. Using a pan like this will give you the traditional shape of Tamagoyaki. Tip: If you don't have a non-stick pan, be sure to use a cooking spray to ensure that the eggs do not stick to the bottom of the pan and burn. Cooking Instructions - Mix all the ingredients in a deep bowl (You can use a fork or chopsticks for this as long as you make sure that all ingredients have been saturated and the eggs have been beaten stiff) As soon as the pan is hot enough, gently place the egg mixture in it until the entire surface is covered. Be sure that the mixture is evenly distributed around the pan so that the omelette cooks evenly on all sides. Using a fork or a pair of chopsticks, gently roll the egg to the opposite side. Like below. Wait until it becomes slightly golden brown then turn off the heat. 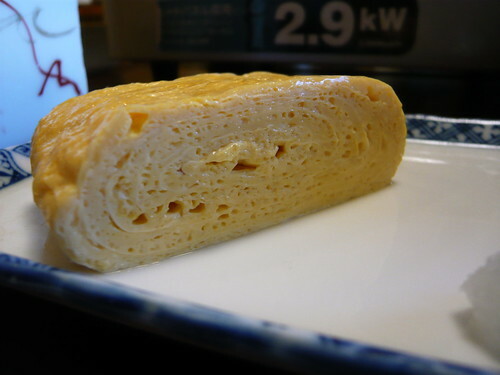 Tip: If you are preparing Tamagoyaki as a dessert, be sure to keep the heat low so as not to burn the sugar. Higher sugar content entails faster caramelization so you have to pay close attention to the heat level. Traditionally, this dish is packed in a Bento box. It is also served in nigiri sushi form. The Bento box usually includes soy sauce and other condiments so that you can customize the dish to your specific taste. Here is an in depth video on how to make Tamagoyaki.